"One of the premium features on MRX series receivers is Anthem's Room Correction (ARC) system... The ARC design makes sense and the performance we experienced with the room correction was excellent." "The MRX 700 handled any video we threw at it and did so with excellent results. Whether if was blu-ray running 1080p 24Hz/60Hz or standard DVD over HDMI, video was free of any objectionable artifacts. The high definition material looked unaltered and as good as we have always seen it in our system. Video revealed the same rich, well saturated colors we have always seen with no false contouring through changin gradations... we were thoroughly impressed." "Anthem always pays a great deal of attention to sound quality, so it was not surprising to expect this receiver to perform well... The MRX 700 decoded Dolby TrueHD and dts-HD Master Audio multi-channel audio from our bD titles without any issues and the sound quality was superb from the crystal clear dialogue to the deep, tight penetrating bass... exceptional fidelity with virtually no fatigue even at higher volumes with long durations." "Those who are familiar with Anthem know their commitment to high performance, so their should be little surprise that the MRX series of receivers meet the critical demands of their followers. 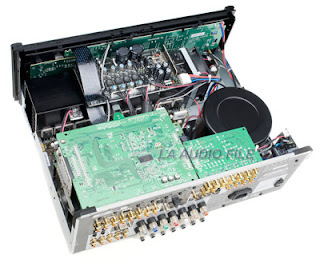 For those looking info an affordable receiver made by a company know for high-end gear, the MRX 700 is it." Click here! to read the entire review plus photographs.